Postmodernism is a way of thinking about culture, philosophy, art and many other things. The term has been used in many different ways at different times, but there are some things in common. Postmodernism says that there is no real truth people can know. It says that knowledge is always made or invented and not discovered. Because knowledge is made by people, a person cannot know something with certainty - all ideas and facts are 'believed' instead of 'known'. There may or may not be some sort of ultimate truth, but we cannot know it. People often believe they know the truth, but their opinion will change later. This is different from traditional views of 'objectivity', which say there is a single knowable truth independent of anyone's observation or opinion. Since postmodernism says that the truth is not truly knowable, different people can believe different things and each think theirs is the only truth. As far as we know, no person can say with certainty that their truth is right and everyone else's wrong. Since we cannot know the truth with certainty, persuading someone to accept your understanding of the truth is like two people arguing about something neither can really see. Postmodernism is not strictly subjective, however. It is more agnostic about whether truth exists, for there is no ground for anyone to say without any doubt there is no objective truth. People can continue to strive to know more, however. Study and research are not necessarily a waste of time. We should just accept that we will never be able to say "that settles it--no one could possibly discuss the issue any longer." This keeping the conversation open, never ending the conversation and being open to what you might learn from others is why postmodernism is not nihilistic. It does not say that no one knows and everyone is free to make up whatever they want, rather that we are enmeshed in complex language games in which we constantly change our opinions about everything. Truth, therefore, is not a single place we can say with confidence we are steadily approaching. Rather, truth is something that each individual constructs within the fabric of their communities and language games. This is in stark contrast to modernity, in which the belief is that we are constantly moving closer and closer to the one truth. Starting with the 18th century Enlightenment and into the early 20th century, many people believed that science and new knowledge would make the world better. They believed that whenever scientists or philosophers discovered something new, it would inevitably make society a little bit better. This seemed obvious with all of the new technology that had come about in the Industrial Revolution, allowing people to have things from cars to washing machines. Many thought that this social progress could not be stopped. Those that believed this believed in Modernism. Postmodernism holds that there is no real "social progress", because different people have different ideas about what social progress is. The Industrial Revolution helped many, but harmed many too. Postmodernism holds that while some things about the world change, people only want to believe that the world is better than it was. It changes but does not get better, because there is no 'better'. Postmodernism says that since peoples' opinions change, and since one person's opinion cannot be more right than another, it means nothing to say that (for example) one work of art is better than any other, only that you prefer it based on a certain set of principles, standards or tastes. Postmodernism says that art, music, and literature, for example, could be right/wrong or positive/negative or forward-looking/nostalgic. Two individuals who disagree have no basis to say that either's opinion is the last word. The author has no more right to decide what a piece of art means than does the art critic; all anyone can say is that the work conforms or does not conform to a set of arbitrary conventions. Some people with postmodern views in art and literature commonly talk about and even makes fun of itself when it seems to take its own opinion too seriously. Postmodernism has influenced many cultural fields, including literary criticism, philosophy, sociology, linguistics, architecture, visual arts, and music. The term postmodernism was first commonly used in the 1949 to talk about modern architecture. Many people did not like modern architecture because it had too many box-like shapes and people did not think it was pretty. Some of them started the postmodern architecture movement. 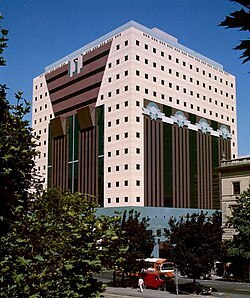 Postmodern architecture uses surface ornamentation, often based on historical styles, and less box-like shapes. Postmodernist ideas can be seen in philosophy, the study of culture and society, literature, architecture, design, as well as in history and law. Postmodernism also led people to think differently about love, marriage, popular culture, and the change in much of the Western world from an industrial to service economy. The term postmodernity usually means the period of time when postmodern ideas became common (the second half of the 20th century). Some experts think that postmodernism is now over, especially in literature. Postmodernism has many different meanings and contexts, mostly indicating some dramatic change from modernity--the way that things used to be. Postmodernism itself would deny there is a single right definition. It would suggest there is much to learn by studying and comparing different definitions if we want to learn more about postmodernism. Compact Oxford English Dictionary: "a style and concept in the arts characterized by distrust of theories and ideologies and by the drawing of attention to conventions". Merriam-Webster: Either "of, relating to, or being an era after a modern one", or "of, relating to, or being any of various movements in reaction to modernism that are typically characterized by a return to traditional materials and forms (as in architecture) or by ironic self-reference and absurdity (as in literature)", or finally "of, relating to, or being a theory that involves a radical reappraisal of modern assumptions about culture, identity, history, or language". American Heritage Dictionary: "Of or relating to art, architecture, or literature that reacts against earlier modernist principles, as by reintroducing traditional or classical elements of style or by carrying modernist styles or practices to extremes: 'It [a roadhouse] is so architecturally interesting ... with its postmodern wooden booths and sculptural clock.'" "When it becomes possible for a people to describe as ‘postmodern’ the décor of a room, the design of a building, the diegesis of a film, the construction of a record, or a ‘scratch’ video, a television commercial, or an arts documentary, or the ‘intertextual’ relations between them, the layout of a page in a fashion magazine or critical journal, an anti-teleological tendency within epistemology, the attack on the ‘metaphysics of presence’, a general attenuation of feeling, the collective chagrin and morbid projections of a post-War generation of baby boomers confronting disillusioned middle-age, the ‘predicament’ of reflexivity, a group of rhetorical tropes, a proliferation of surfaces, a new phase in commodity fetishism, a fascination for images, codes and styles, a process of cultural, political or existential fragmentation and/or crisis, the ‘de-centring’ of the subject, an ‘incredulity towards metanarratives’, the replacement of unitary power axes by a plurality of power/discourse formations, the ‘implosion of meaning’, the collapse of cultural hierarchies, the dread engendered by the threat of nuclear self-destruction, the decline of the university, the functioning and effects of the new miniaturised technologies, broad societal and economic shifts into a ‘media’, ‘consumer’ or ‘multinational’ phase, a sense (depending on who you read) of ‘placelessness’ or the abandonment of placelessness (‘critical regionalism’) or (even) a generalised substitution of spatial for temporal coordinates - when it becomes possible to describe all these things as ‘Postmodern’ (or more simply using a current abbreviation as ‘post’ or ‘very post’) then it’s clear we are in the presence of a buzzword". British historian Perry Anderson says that postmodernism is an important concept and is important for the study of contemporary (current) culture. ↑ Kirby, Alan (2006). "The death of postmodernism and beyond". Philosophy Now #58. ↑ "AskOxford: postmodernism". www.askoxford.com. Archived from the original on 2010-01-07. ↑ Perry Anderson, 'The Origins of Postmodernity', London: Verso, 1998. Bullock, Alan & Trombly, Stephen. 1988. The new Fontana dictionary of modern thought. HarperCollins, London. Post-modernism entry, p673, is by Sir Malcolm Bradbury. Lyotard J-F. 1979. The postmodern condition. Jameson F. 1991. Post-modernism: the cultural logic of late capitalism. Marsden D.L. 1995. Post-modernism: a bibliography 1926-1994. This page was last changed on 11 April 2019, at 00:49.